Becky Latcham in Culture & Arts Editor's Picks Film on 25 November, 2018. With one of our lifetime’s most lauded storytellers as its writer, Fantastic Beasts: The Crimes of Grindelwald (directed by David Yates – who also directed the final four Harry Potter films and the first instalment of the Fantastic Beasts franchise – and written by J. K. Rowling) had decidedly big boots to fill in terms of audience expectation. I enjoyed the first Fantastic Beasts, with its exciting take on 1920s Wizarding America, endearing protagonist, and interesting premise. However, Crimes of Grindelwald just did not deliver as the exciting sequel that it could’ve (and should’ve) been. However, we’ll begin with what was done decidedly well – Newt Scamander. Eddie Redmayne’s performance as the ‘magi-zoologist’ was nuanced, convincing, and consistent. He portrays an interestingly unconventional masculinity that’s rare in the protagonists of blockbuster films. Some of the best scenes of the film are centred on Newt and his interactions with others, particularly those characters (such as Tina Goldstein – played by Katherine Waterston – and Jacob Kowalski – played by Dan Fogler) where the relationship portrayed is building on an existing foundation. There’s sincerity and development in these scenes. This brings us to the next point; Crimes of Grindelwald is a film that tries to squeeze far too much into far too little time. As a result, it’s hard for us as an audience to establish connections with the multitude of new characters with rushed introductions, the story arcs and lore of this magical universe that’s being thrown at us without proper dedication. The film has some scenes that seem like they’re supposed to be emotionally weighty, but the audience doesn’t have enough of a stake in the characters for there to be that emotional depth and pay-off. This creates another problem; scenes are filled with exposition. A film becomes wanting if it builds on a “then” plot, rather than a “hence” plot; where events seem to happen as discrete entities, rather than one scene always causing what happens in the next. However, the film is successful at planting minor plot points at its start and making sure to include a conclusion to said plot point by the end (slotting together the puzzle pieces is an enjoyable experience), but they are generally minor. The performances of the supporting cast were very good, but many characters lacked depth. The story arc of Credence Barebone (played by Ezra Miller), for example, exists but lacks conviction and motivation. The presence of Nagini (played by Claudia Kim) – now in the form of a human woman rather than a snake – is superfluous to the film, unexplained, and adds next to nothing to the plot (which suggests the notion of tokenism). I was interested, but apprehensive, to see Johnny Depp’s performance as the villain, Gellert Grindelwald. Whilst Depp’s performance is good enough, it lacked the gravitas and charisma befitting a villain of renown and notoriety. I was unconvinced by it. This could be down to poor characterisation in the script, or Depp’s deliverance, but I believe it’s likely a combination of the two. Jude Law’s performance as Albus Dumbledore, on the other hand, was great; slight idiosyncrasies in his manner were brilliantly reminiscent of Michael Gambon’s Dumbledore from the Harry Potter films. The set design and costuming team for Crimes of Grindelwald must be greatly commended on their work; the 1920-30s aesthetic is beautiful and well-executed, discrete to the different cities (London, Paris, New York) that the film jumps between. The costume designs are recognisably personal to each character, diverse but coherent as a whole. 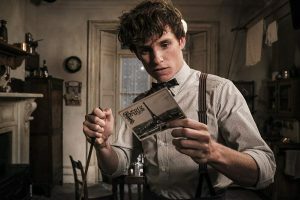 Another element that worked well in the film was the smooth existence of magic in this universe; we are dealing with an adult Wizarding World here, and the varieties of magic are wide and capable. Contextual factors to the time period are also successfully echoed in the film’s themes (dark questions of fascism and elitism, marriage, and international relations). The SFX and art department did a wonderful job, and the film does have its moments of spectacle and grandeur. Perhaps, as a generation containing many of those who’ve grown up with Rowling’s work close to their hearts, we invest too much into the Harry Potter universe, and are disappointed as a result. 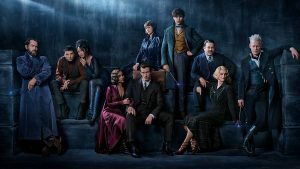 However, I think it’s fair to expect a nuanced and thoughtful sequel in this new branch of the Wizarding World franchise; especially considering the announcement of multiple subsequent films – this series has the time and the budget to develop its world and story effectively, but Crimes of Grindelwald fails to fully do so.